Gifts from the Pirates: "If you change the way you look at things, the things you look at change." Seth's room will always be my favourite room in the house, it screams 'Me' and is the room i would have loved as a child. 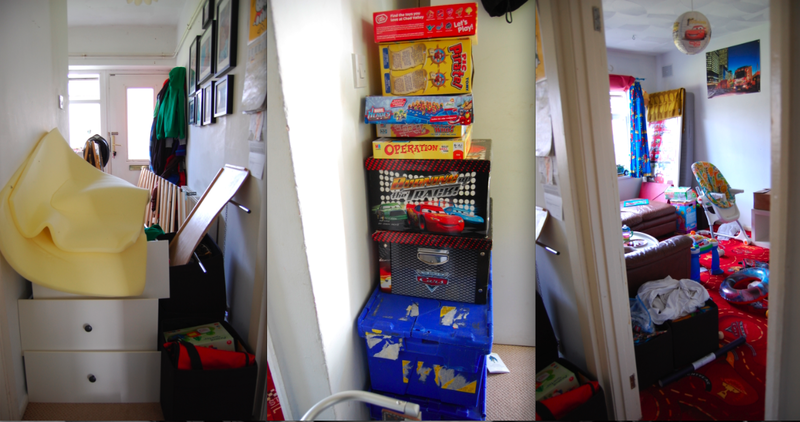 Back when i wrote my last post about Seth's room he didn't really spend a lot of time playing in there and the toys were transported backward and forward to the lounge, which can be quite monotonous when tidying up every evening plus as you can see from above the lounge became very cluttered. There will come a time soon when Opeie will no longer be sleeping in our bedroom and will be in with Seth so with that in mind the obvious thing to do was to change the rooms around. Our home is all on one level due to Seth's medical needs and the Lounge is the largest room in the house so we decided last week to turn it into Seth's bedroom/Playroom/Daytime lounge which is great for the boys but also has the added bonus of leaving an adults lounge for me and Mrs M to relax in of an evening. Somewhere grown up and toy free (even though until it is sorted it has lightening Mcqueen carpet in, very relaxing). The two days it took us to move everything about, the house looked like a bombsite and it was really stressing Mrs M out, even though our home is rammed with 'stuff' she hates clutter. It took the both of us about 2 hours to get our L-Shaped sofa out of one room and into the next which tried on our patience a fair bit but we got there in the end. There were books and toys EVERYWHERE, making the whole house not very safe for Opeie which was also a pain. We really needed a large space for them to play but we also added a sofa to the room too so that they had somewhere to sit. We did debate putting a TV in there but both myself and Mrs M both agree that children of their age don't need one in their room. I never had one when i was that age its just unnecessary. We finished the room late afternoon on the second day and the outcome is amazing, im jealous its not my room and it is my favourite room even more now. 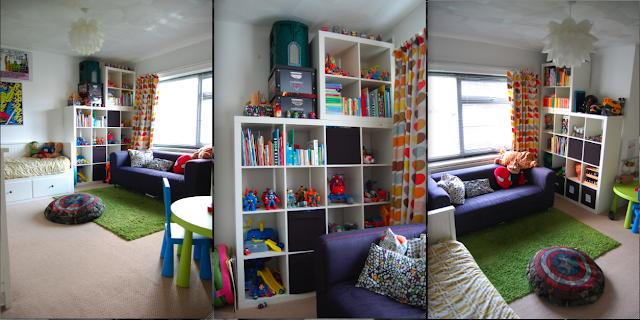 Its clean and tidy with loads of space for play and even a simple thing like added blinds really made the room. It's great being able to display all of the boys imaginext toys together. and theres so much more room now to wrestle on the floor (I'm quite sure that's not what Mrs M was going for though). Mrs M is adamant that the pictures she took were much better than these and she described my photo's as "Awful", i disagree but being the nice chap that i am i have included Mrs M's photo's for you to decide. I really value her input when it comes to the blog but we cant agree all the time that would just make things boring. Seth was so excited about his room and has wanted to be in there all the time but part of that might be because we have told him that his toys stay in there so that we can keep on top of the rest of the house. It makes it easier for us to make sure the house is free of any obstacles as both our boys can be a little uneasy on their feet. Well were now moving on to our 'adult lounge' so expect a post about that very soon although i may avoid taking photos until we have removed Lightening Mcqueen and Mater from the floor. Mrs M's Photos look better. This is such an AMAZING room!!!!!!!!!!!!!!!! I have just come back on your blog to look at this as i want to do my boys room like this! I love everything about it. Your so clever!!!!! Have you seen the new BatMobile bed in next??? It is so cool!!!! I love this!!! Well done! Saw it on Pintrest and read about it here, totally inspirational! Thanks, were thinking about giving it a makeover again now. Any ideas? thanks for your comment. That's such a cool room, saw it on pintrest and had to click! well done you!!! wheres the cap america bean bag from? The beanbag is actually a dog bed that we never used so we filled it with beans instead. gotta find a use for what youve got. thanks for reading.